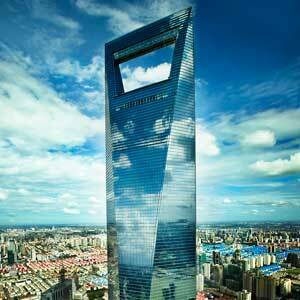 The Shanghai World Financial Center (SWFC) is a symbol of commerce and culture that speaks to the city’s emergence as a global capital. Located in Shanghai’s Pudong District, the mixed-use SWFC is a vertical city, containing offices from the 7th to 77th floors, urban retail and dining spaces, and a 174-room five-star Park Hyatt Hotel from the 79th to 93rd floors. Above the hotel, at the 94th to 100th floors, is an observatory including Sky Arena 94, Sky Walk 97 and Sky Walk 100. Shaped by the intersection of two sweeping arcs and a square prism – shapes representing ancient Chinese symbols of heaven and earth, respectively – the tower’s tapering form supports programmatic efficiencies, from large floor plates at its base for offices to rectilinear floors near the top for hotel rooms. Its boldest feature, the 43-meter-wide portal carved through its upper levels relieves the enormous wind pressures on the building. This boldness has allowed the SWFC to endure as an indelible feature of the city’s skyline, even as it has been eclipsed in height by its neighbor, Shanghai Tower.